In 2013, the Atlanta Braves had finally come together. Frank Wren’s team was young – Dan Uggla was its only starter over 30. Frank Wren’s team was also very powerful and bashed 181 homers led the league. Sure, they struck out a lot, but they also scored runs in bunches. But lost in all of the feast-or-famine articles about the Braves’ offense was its fine pitching staff. While Brandon Beachy would miss most of the season, the Braves got breakout years from Mike Minor and Julio Teheran. Young Alex Wood also pitched in, which became important when Eric Young Jr. shattered Tim Hudson‘s ankle one night in Flushing. The 2013 Braves also had a righty who had finally stayed healthy all year and earned an every-fifth-day assignment in the rotation in Kris Medlen. “Meds” had been lethal down the stretch in 2012 after finally receiving a late promotion to the rotation. The Santa Ana College alum followed it up with career highs in most categories in 2013. But then, like Breachy, Medlen would not make it out of the 2014 spring training before needing a second Tommy John surgery. It was the first couple of dominoes to fall in what would be a franchise-altering season. Wren would be fired and a rebuild would be ordered – one that would not include Medlen, as he was non-tendered after the 2014 season. There was some hope the Braves might bring him back, but two weeks after Atlanta cut him loose, the Kansas City Royals promised him $8.5 million to come to the midwest. 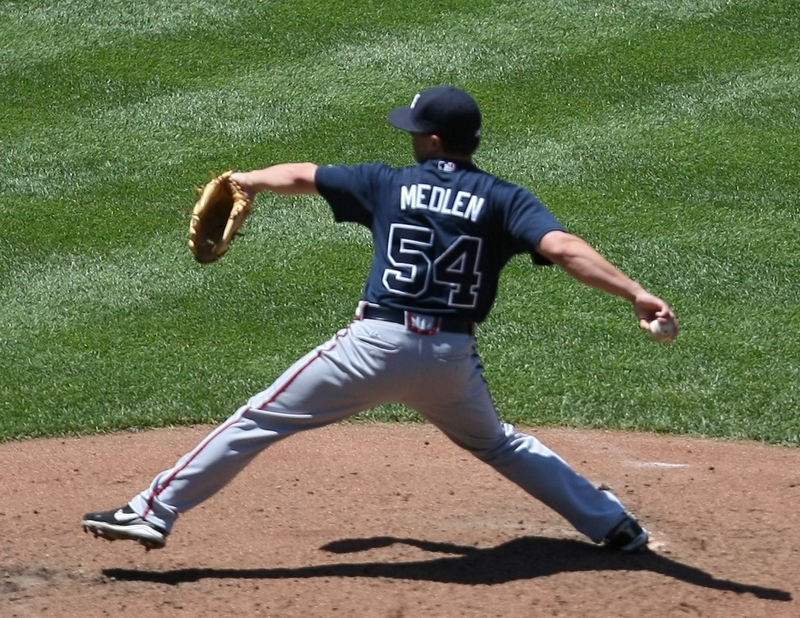 His rehab took a long time, but Medlen finally returned to the majors on July 20, 2014. He had a few stinkers mixed in over a 15-game run with the Royals, but still pitched his way onto KC’s postseason roster. He would pitch twice – once as a long reliever after Johnny Cueto got blasted and the other time in KC’s World Series Game Three loss to the Mets. The hope was that Medlen would stabilize a Royals’ pitching staff in 2016 that would lose Cueto and was thin beyond newcomer Ian Kennedy, veteran Edinson Volquez, and young Yordano Ventura (may he rest in peace). Instead, Medlen would struggle over six starts – especially with uncharacteristic wildness. His shoulder was hurting, which put him on the shelf He made a pair of comeback attempts, but was never able to get back to the Royals. His final outing of the year included retiring just one of the five Oklahoma City Dodgers he faced before being lifted with a line of 0.1 ING, 4 H, 4 R, 4 ER. 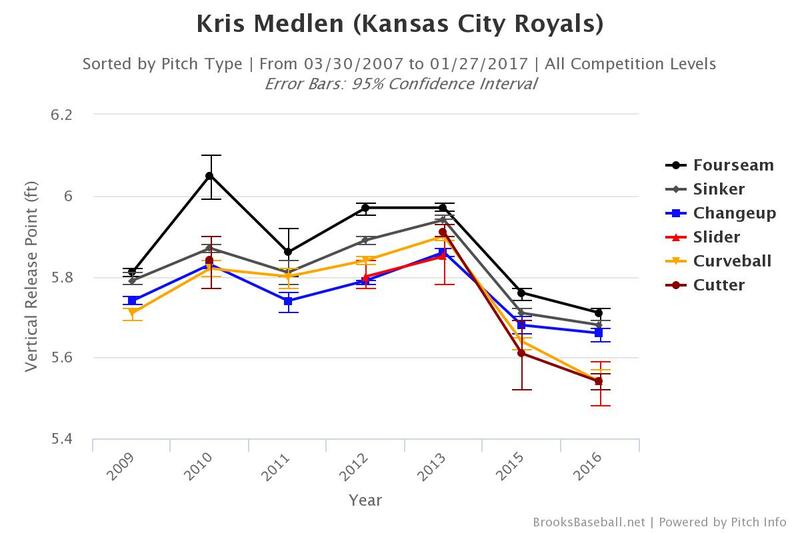 Let’s try to compare the Medlen the Braves loved so dearly with the Medlen whose 2017 option was declined by the Royals. Pitch-wise, little has changed as far as usage and velocity go. He relies heavily on a low-90’s sinker, throwing it 38% of the time last year. In fact, when you combine his four-seamer, about every other pitch on average is a fastball. He’ll supplement that with a biting curveball that flutters to the plate at about 78 mph along with a changeup that has averaged 2-3 ticks faster since leaving Atlanta. He started to use a cutter toward the end of his Braves’ stay and used it a lot more last year to mixed results. One clear difference in Medlen since leaving Atlanta is related to release point, which the chart to the right shows courtesy of Brooks Baseball. In 2013, the ball was between roughly 5’9″ and almost 6″ feet off the ground when Medlen released the ball. Once he returned in 2015, he was releasing at more of a lower 3/4’s rather than the high 3/4’s of 2013. As a sinker-baller who depends on controlling the ball low-in-the-zone, not being able to get on top of his pitches won’t help his effectiveness. Medlen is a nice lottery ticket for the Braves to add – even as a relief option rather than a starter. If they can straighten his mechanics and get him to drop his changeup from the 84-85 mph range, it would be a big boost. Whether it was losing feel, the different arm slot, of Royals’ coaching, Medlen lost his best pitch when he left Atlanta. In 2012, his changeup had a 16.6 wCH as far as pitch value goes. He didn’t have enough innings to qualify for the ERA title so he didn’t make the lead leaders list, but that pitch value would have ranked second. The next year, his breakout starter campaign, his changeup had a 12.6 wCH pitch value. That ranked sixth. It was his one true dominant pitch and it’s been worth -2.4 since. That has to change. At his best, Medlen can fool hitters with his fastballs and changeups and go to his curveball for strike outs. We haven’t seen that version of Medlen since 2013. If the Braves are lucky, we could see it again in 2017, though it won’t be until midseason at the earliest. Until then, it’s nice to hope.